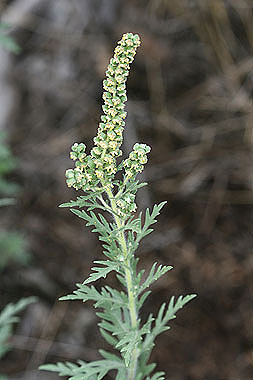 Ambrosia psilostachya is a widespread ragweed species. Leaves are pinnately dissected. Male flower umbels hang along the top of the stem. Female flowers are inconspicuous and are located in leaf axils. 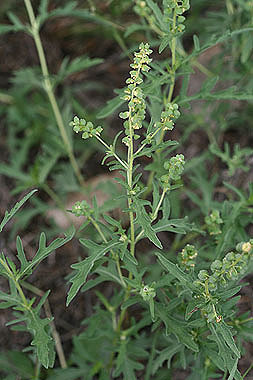 Ragweed pollen causes hay fever. Compare to Ambrosia trifida, which has broader leaves. A. trifida has a black rib on the involucre of the male flower umbels. Compare to Ambrosia tomentosa, which has more finely dissected leaves. Female flower heads are spiny burrs.